Our product range includes a wide range of vibro sifter and inline vibro sieve. 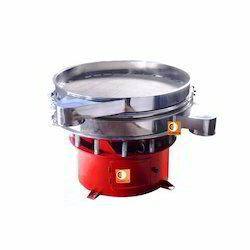 We are the manufacturers of Vibro Sifter. Vibro SifterSieves usually use vibration energy or a combination of Vibration & ultrasonic energies to achieve screening. Sieves have to be specially designed to resist the high tensile stress generated. Since Particle Size Distribution plays a vital part in drug dissolution, maintaining the accuracy of the sieve apertures is an essential part of sieve manufacturing. Proper thickness of wire, accurate nominal aperture sizes, high tensile strength & tautness of the sieve are essential for high sifting performance.